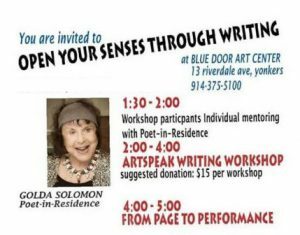 ArtSpeak/From Page To Performance Blue Door Art Center’s successful creative writing series partially funded by Poets & Writers returns each 3rd Saturday of the month with an invited co-host, artist. Guest John Maney. Encourage the use of all your senses through writing, art & music. Light refreshments served. You may bring a snack for the ‘creative table’ RSVP online and pay at the door.